Snickers Clothing have created a range of Childrens cloths so your youngest can emulate you, Warm and cosy, with a cool look. Maximise your activities in this Junior hoodie. Made to keep its shape wash after wash. Features comfy kangaroo pockets to warm freezing little hands. 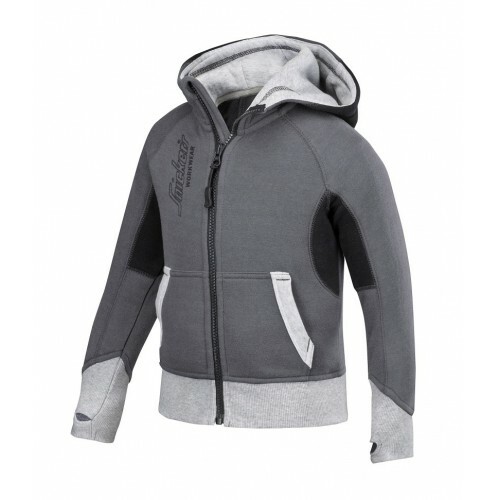 is warm, comfy hoodie and is rugged enough to withstand all the situations kids get involved in! It’s designed to keep its shaped wash after wash, and comes pre-washed and pre-shrunk to instant comfort. Kangaroo pockets on the front of the children’s hoodie keeps your hands warm in the cold, great for the Irish Winter. The cuffs and hem of the hoodie is ribbed, keeping the top tight to the body to keep in the heat. Thumb grips also come as standard, allowing kids to keep their full arm warm even when stretching or climbing. Comfortable, durable fabric in 65% Polyester and 35% Cotton, 300 g/m². Pre-washed and brushed inside.